A provincial masterpiece. 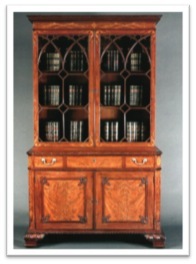 The Rawlinson bookcase, made by Richard Gillow, 1772, for Mary Hutton Rawlinson the rich widow of a Quaker Lancaster/West Indies merchant. Judges Lodgings Museum, Lancaster.